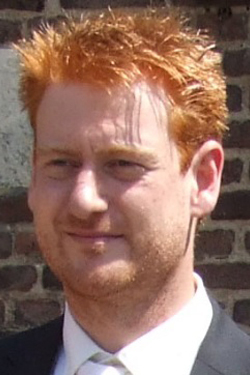 Dr. Patrick van Rijn got his Masters (University of Groningen) and PhD (Delft University of Technology) in organic/physical chemistry. During his post-doc (RWTH Aachen), he used the knowledge of chemistry and extended it to the chemical modification of proteins and used the specific physiochemical behaviour of such modified bionanoparticles to create new materials. Since 2013, he holds a tenure track position at the University Medical Center Groningen within the department of Biomedical Engineering focusing on using his chemical skills and materials expertise to develop structures for biomedical applications. Physical Chemistry, Organic Chemistry, Biomaterials. Our lab at the UMCG currently hosts two PhD students and five MSc students with nationalities from all over the world (Germany, China, Columbia, Portugal, India) with backgrounds ranging from chemistry to cell biology and biomedical engineering. Developing new materials and (nano)material fabrication methods for biomedical applications allows us to work on the interface between chemistry, material science, biology and medicine. The research and responsibilities are jointly carried by the group and this is accompanied by a very collegial and friendly atmosphere with the intent to achieve the next generation biomedical application development as a team.